The Mucky Pups Dog Grooming Centre at the Industrial Estate, Wick is open all year and offers an excellent service for very reasonable rates, plus free TLC with every trim. A well groomed dog is a happy dog. We aim to create the style of the breed or what the customer would like (as long as the dog is not too matted). 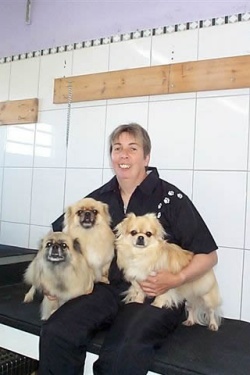 Dogs come in for the appointment - which is one on one - and then get picked up, so they are only on the premises between one and two hours thus making their stay as unstressed as possible. If the dog is old, extra time can be allowed so everything is done at the dogs pace. A bathing service is provided for puppies so they get used to being groomed, but they are only in the shop a short while so they don’t get bored. This service is extended to all breeds if the dog needs it between grooms. a message can be left. Calls will be returned a.s.a.p.